In the whole movie, that guy keeps roaming behind the girl. Doesn't he have work. Even at the time of robbery, enquiry counter was empty so manager sends the girl to enquiry counter. Shouldn't manager have send the boy to that counter because he was doing no work! There is a hole in 'thaali' because Akshay Kumar shooted bullet through it. But, in next shot, the hole has disappeared. Here, Arjun Rampal is holding the gun. 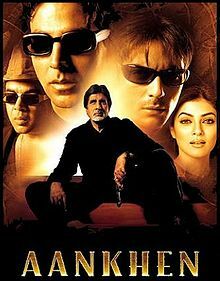 Suddenly, Akshay fired the same gun at Amitabh. How does gun came to his hand?